StudioRIP provides advanced flexo capabilities, at an affordable price, with various tools perfect for the flexo industry. Custom Angles - Angles can be fully customized via the angle editor, allowing custom angles to be set. 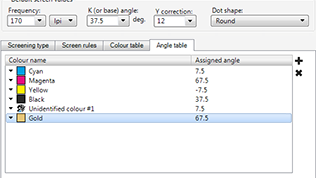 Specific Spot colors can be assigned their own angles or spot colors can be dynamically assigned angles which will not clash. 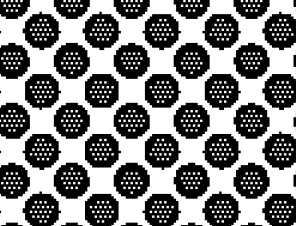 Dot shapes - For gravure based printing special gravure dot shapes are available. Hybrid Screening - Hybrid Screening comes as standard with ability to select a dot size to be used, and reducing the numbers of dots to give a perceived tonal range across the board. 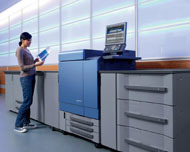 Shifted Hybrid - As well as standard Hybrid screening, StudioRIP offers Shifted Flexo Screening. This flexo optimized screening allows for smoother transition between AM and FM. Pillar Dots - With Pillar Dot screening, very small highlight dots are protected from falling over and becoming scum dots by larger dots which act as a pillar in a similar way to bearer bars. Ink Spread Compensation - While Calibration works well on press in reducing dotgain on halftone objects it has little effect on objects such as line work and especially reversed-out text. 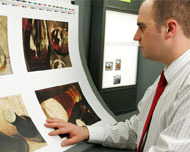 The Ink Spread tool compensates for gain on press on solid items by choking objects so that the gain on press brings the objects closer to the original size rather than being larger Ink Spread Compensation had not been applied. Dot chunk removal - Using a defined size in the number of Pixels, the RIP will scan the ripped pages and remove undersized chunks of pixels eliminating the chance of Scum Dots. Texture - Increasing the ink density on the substrate during printing is possible with the texture feature inside the RIP. On solid areas and within halftone dots instead of having a flat top, a light texture is applied which results in the surface of the dot attracting more ink, which is subsequently transferred to the substrate. Dispro - Distortion can be added as a value in the job style, or can be calculated using the built in tool provided by entering the cylinder information and plate details. 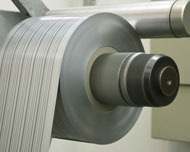 Seamless - Suitable for making Flexo and Gravure sleeves. 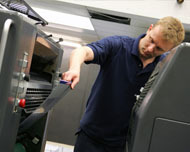 Lower Screen Limit - The smallest halftone dot size to be printed can be selected to avoid scum dots from being formed. Powerful Viewer - The integrated viewer allows viewing of single separations, multiple colors or all colors of a job right down to pixel level. The Dot % viewer allows users to see the color mix on any part of the job. Multi Screening compatible - The RIP will manage multi screening inside a PS or PDF job. In addition the RIP allows setting to override the inherent screening, for example turning a part of the job set to 100LPI to FM screening. Bearer Bars - Bearer bars can be added easily to jobs; these can be customised and be configured to user needs. Device Support - StudioRIP drives all leading Flexo CTP machines but also can utilize Epson printers to create Flexo films.